Linkedin filed a lawsuit this week against parties unnamed after it found out that bots are being used to scrape data from thousands of site users. 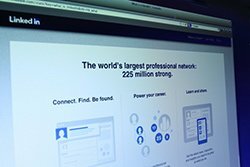 The lawsuit was filed in federal district court in northern CA, and it alleges that several automatic software programs signed up thousands of fake members in Linkedin to extract data from real profiles. This has been going on since May 2013, the suit alleges. Scraping of data is not allowed, according to the user agreement on the site. It also, it is claimed, to break state and federal laws on computer security. The complaint states that the illegal scraping undermines the effectiveness of the professional network on Linkedin. The argument is that the network is being polluted by thousands of fake profiles. Also, by taking data from the website, the recruiter product is being diluted in value. Linkedin Recruiter lets headhunters and recruiters look for candidates from the firm’s 258 million user database. About 16,000 companies pay to use the service. Linkedin is believed to have traced the fake accounts to an account on Amazon Web Services (Amazon has been up to some very interesting things lately!) Linkedin is asking Amazon to give them the names of the owners of those accounts. Linkedin thinks that the parties who are responsible for this scheme knew what measures that Linkedin takes to limit the activity on each account. This is the reason that thousands of fake accounts were created. Linkedin is working to disable fake user profiles and it also has added safeguards to protect against fake users using the site. It is not known yet what the defendants intended to do with the information that they scraped. Experts in the IT industry say that the big battle is going to be in the engineering department at linkedin, not in the courts. They say that Linkedin will be spending a lot of time trying to determine how to block the fake accounts and how it can stop the copycats. Linkedin is just one social media site that is fighting fake accounts. Twitter also has been fighting spam and fake accounts. Twitter thinks that fake accounts amount to 5% of its users, but it is hard to say for sure. Social media sites do not want to have fake, spam accounts, because it can damage their reputation for delivering relevant custom content to users. And, advertisers do not appreciate paying millions of dollars to advertise to users who do not exist.